San Francisco, CA – May 15, 2013 — Vector Unit, the indie game developer known for top-selling mobile racing titles Beach Buggy Blitz™, Riptide GP™ and Shine Runner™, announced at Google I/O, Google’s developer conference, that all its games will offer full support for Android’s new Google Play game services starting immediately. The company’s premium water racing titles, Riptide GP and Shine Runner, and its popular free-to-play “endless driver” Beach Buggy Blitz, all receive updates today that allow users to log in with their Google accounts to earn Achievements, post scores to Leaderboards, and sync their game progress using Cloud Save. Vector Unit’s upcoming sequel Riptide GP2 is also showcased at Google I/O this week to demonstrate Google Play game services’ real-time multi-player capabilities. 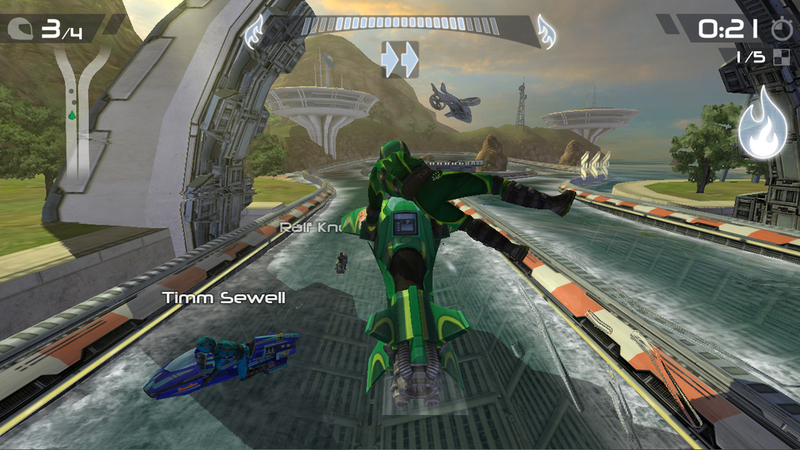 Google I/O attendees can play Riptide GP2 this week in the Sandbox on the third floor, and also with NVIDIA, where it’s being shown running with extra graphic features on NVIDIA’s new Tegra 4-based Shield devices. Riptide GP2 is due to be released on Android and iOS this summer. In addition to multi-player gameplay, the game features a new deeper career mode, player and hydro jet customization, and a stunt combo system with dozens of spectacular stunts. The good people at Google have invited us to participate in the Developer Sandbox at Google I/O this year, and we couldn't be more thrilled. First of all, we're excited because we love Google I/O. We were fortunate enough to be part of the Sandbox last year with Riptide GP. We got to meet a ton of other developers working on amazing new projects, participate in the conference, and of course managed to score some of that sweet Google I/O swag. On top of just getting to attend the conference, of course, it also feels really good to have the Android team at Google recognize our work and invite us to join them. But the other reason we're excited is because the game we're going to be showing is our brand new, as yet unannounced title. No details yet about what the game actually is -- attendees at Google I/O are going to be the first people outside of Vector Unit to see and play it. So stay tuned for the official announcement next week. We hope you like it -- and if you're attending, we hope to see you in the Google I/O Developer Sandbox in a couple of weeks! Vector Unit has been selected from hundreds of developer applicants to exhibit in the Sandbox area at Google I/O 2011. The team will be on hand to demo our latest game, Riptide GP, the first console quality water racing game for mobile phones and tablets. Riptide GP features superfast hydro jets racing through futuristic landscapes across a dynamic, ever changing surface of water. We're super excited about the opportunity to exhibit at the show, and grateful to Google for giving us a chance to participate. Come by the booth and visit, and check out the near-final version of Riptide GP!